Oi, listen up. 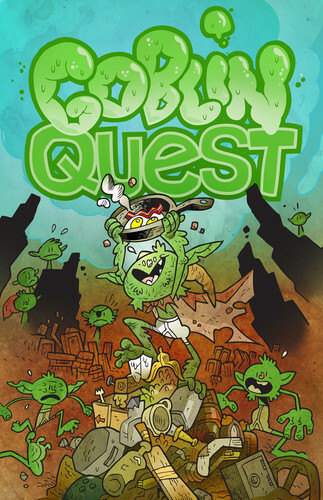 I found this here Goblin Quest game. That makes me the Goblin King Boss. Y’all gottsa do what I say, or else I’ll hit you with it. And I say we’re gonna play Goblin Quest. That’s us, dummy. Look at yourself. Small, green, smelly and stupid. But you have brothers! Or maybe sisters, no one bothered to check. We run around and get into trouble. We also die sometimes, but that’s not too bad. There’s always more goblins. We are foot soldiers in the army of Evil. That means we fight people’s feet, mostly by having them trip over us. There’s also other Evil folks here, black wizards and orcs and hobgoblins and bugbears. The book talks about them, so we know who we’re dealing with. But we are the most importantest, that’s why the game’s about us. The world is our ostrich. What we think goes. We are like hyperactive five-year-olds that way, finding treasure in dung heaps, cobbling warmachines out of cooking pots and getting ourselves gruesomely killed. If we think we can do something, we probably can. Or we could die. There’s lotsa dying. We have clutch-names and just names and Ancestral Heirlooms and Expertise and stuff. We write it all down, and we draw ourselves on the goblin sheet. That’s important. It’s also very important, the book says, to speak in goblin voice. Silly book, how else would we speak. It all starts with a plan. We make one. Mine is better, because it has more boom. But maybe we can add boom to your plan, that also works. Once we know what we want to do, we make a list of three tasks. No, that’s four fingers. No, that’s six. Where did you get six fingers? Awesome, I’m sure that bugbear wouldn’t mind. We make a list, and for each task we make another list. Lotsa lists. We can also have a Goblin Master order us around, but we don’t need one. Then we roll some dice, Fiasco-like. Fiasco. That’s like. That’s like when other people pretend to do things like us, but not as awesome. There are tables with Things Wot Can Go Wrong, and we pick some from the ones rolled. Then we are off on a quest! Going task by task and stage by stage, we describe what we do, and then we roll a die. If some of our things from the goblin sheet apply, we roll more dice. That’s good and bad: all results apply. Which means we could succeed more, or we could get ourselves killed quicker. Make that good and good. Each stage has a difficulty, we only need that many successes to move on. It don’t matter what we do, as long as we advance the plan. And eventually we’ll have advanced it all the way to the end. We’ll all be a little wiser, and a lot deader by then. It’s that simple, even a goblin can play it. With three goblins (at a time), we finished the game in under three hours, including rules and setting explanation. The game doesn’t outstay its welcome. And it’s funny, because it gets out of the way and lets us be funny. The octopus-wizards and the idiot orcs and the irrepressible goblins help. And speaking in goblin voice is important. It breaks down the barriers, making it that much easier to be silly with your ideas. Sometimes, the dice can screw you: we found the bugbear kitchen to be a deadly place, full of hungry bugbears. Sometimes, the dice can be on your side: panicking, jumping up and pulling on a wizard’s fake beard actually works. Walking through a magic circle with said beard because you’re now a wizard doesn’t, though. It’s also possible for the dice to stall you on a single scene, until you start running out of ideas. But eventually they relent, and you move on. Two of us have actually run out of goblins by the very end. One of the goblins had shown up on a trapeze as we were flying away on a griffon, rolled two wounds on his first action to steer the griffon, and failed to stick the landing. A very swift goblin, that one was. There’s very little strategy in the game, very little one can do other than have fun with it. Which is liberating: you don’t worry about making bad decisions. Of course you’re making bad decisions, you’re a goblin. It’s possible to make your goblins too silly, though. If none of the things on your chara-, er, goblin sheet apply, you’re stuck using only one die. But it’s also in your hands to change the situation so that you can get that Expertise: Competitive Belching into play. I did stall a very slowly moving gargoyle with it. The gargoyle may have been roaring slowly, but I think I won that competition. It’s not a kind of game you can play often, though there are plenty of rules hacks in the book to give it a different flavor which we are yet to try. But as a back-up plan for when someone fails to show up to the games night, it’s wonderful.